The Redcar sea defence units are part of a £30 million pound investment into regenerating the town seafront. Macrete (Ireland) Ltd supplied 1700 custom made pre-cast concrete Revetment Step Units for the Environment Agency sea defence improvement scheme currently being implemented along 2.2km of the Kent Coast between High Knocke and Dymchurch, for which the Main Contractor is Birse Coastal. Macrete’s £5.5m contract provides for the supply of nine different types of pre-cast revetment units over a 22 month period. 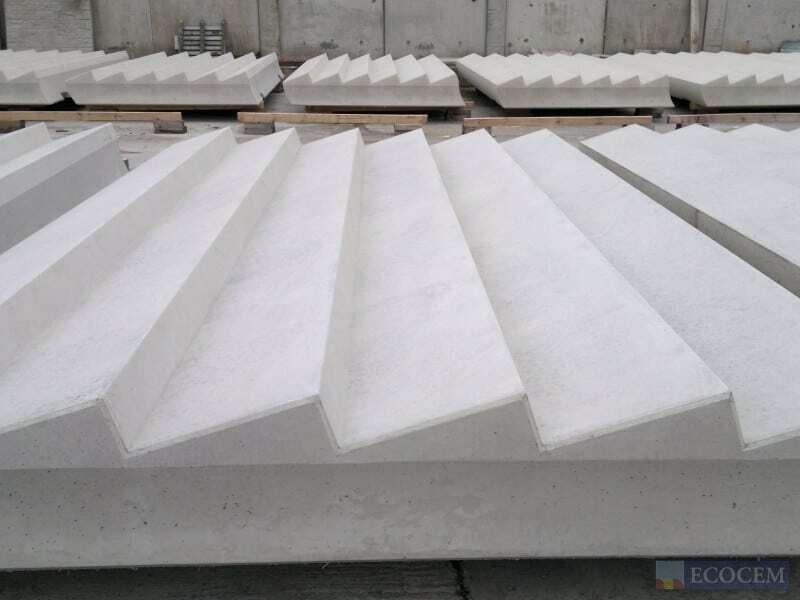 The precast revetments are manufactured in 4 and 5 step formations in a range of incremental lengths and are installed in rows of 3 – 5 units deep, with tapering joint widths which provide the lateral curvature necessary to match the shape of the coastline. Weights range from 15 – 21 tonnes. The units are manufactured at Macrete’s Northern Ireland factory ahead of installation schedule and cargo shipped in 2,200 ton batches in a 60 hour passage to Rye Harbour, with sailings approximately every 3 weeks. Units are craned into position onto the prepared coastal foundation with the aid of a specially designed and manufactured vacuum operated lifting device which grips the units on their upper face. This enables the units interlocking tongue and groove connection between panels to be made without the presence of lifting eyes on any visible surface. The revetment step units will provide an attractive walkway and pedestrian access to the sandy beach in addition to their wave and flood resistance. The Environment Agency scheme is designed to offer improved flood protection to 2,500 homes in Dymchurch which are below sea level. In addition to the revetment units the scheme will also include a new precast wave return wall consisting of 870 units, together with associated access steps and viewing platforms, along the seaward side of the promenade with a raised flood wall between Dymchurch town and the new promenade. The scheme is due for completion in 2011. Awards – Winner of the 2006 Irish Concrete Society Design and Construction Awards.